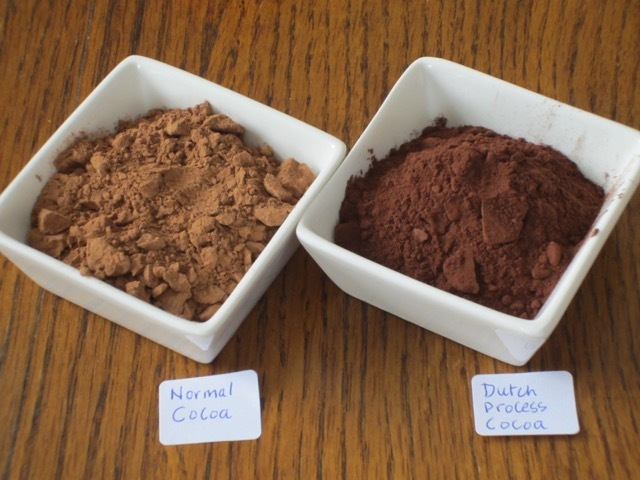 What is the Difference Between Dutch-process and Natural Cocoa Powder? How is Dutch Process Cocoa Made? Dutch-process cocoa powder is made from cocoa (cacao) beans that have been washed with a potassium solution (alkali solution), to neutralize their natural acidity. The alkalization process reduces bitterness and improves solubility and dispersibility which is important for beverage product applications. Natural cocoa powder is acidic and more bitter in flavour. The Dutch-process (alkalized) cocoa powder is darker in colour, ranging from brownish red to nearly black, with a pH from 6.8 to 8.1. Natural cocoa powder is light brown and acidic with a pH level of 5.1 to 5.4. The alkalization process reduces bitterness, so Dutch-process cocoa is less bitter with a smoother and mellow taste. Natural cocoa powder is bitter with a more intense flavour. Sodium bicarbonate (also known as baking soda or bicarbonate of soda) is an alkaline chemical that gives off carbon dioxide when mixed with an acid to cause products to rise during baking. Most commercially available baking powders are made up of sodium bicarbonate and one or more acid ingredients. When you add baking powder to a wet cake batter, the acid ingredients in the baking powder, react with the sodium bicarbonate to give off carbon dioxide and this causes the cake to rise. On the other hand, baking soda is only made of sodium bicarbonate which is alkaline. It does not contain any acid ingredients. In order for baking soda to cause a product you’re baking to rise, you must use acidic ingredients like lemon, yoghurt, buttermilk or brown sugar (molasses in brown sugar is acidic) to cause it to produce carbon dioxide. Natural cocoa powder is acidic and so it can be used with baking soda without any problem. Dutch process cocoa powder is alkaline so technically, you can only use it with baking powder. If you plan to use baking soda then you must ensure that the batter has other acidic ingredients like lemon or buttermilk. It is important to use the type of cocoa specified in a recipe because it may affect the recipe’s balance of acid. Very interesting. I was not even aware there were two different kinds. Thanks Liz. Oh yes there are. I love the Dutch process one! Very interesting – I have often wondered about these two processes. Good to know about the interactions with baking soda and baking powder.